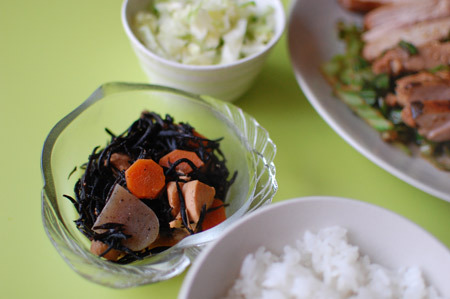 Hijiki-no-nimono can have any ingredients – but I usually cook with carrot, konnyaku, aburaage (fried bean-curd), chicken thigh and chikuwa (fish-cake). You can also add soy beans or/and snake beans. Since I didn’t have chikuwa in my fridge, I cooked without it. You can find abura-age and chikuwa in freezer section at Asian grocery shop. 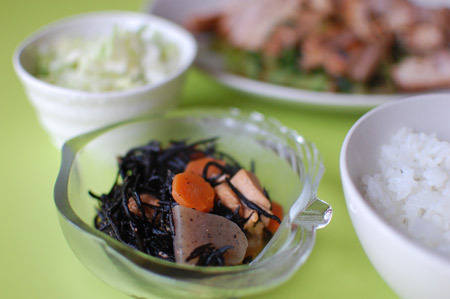 Konnyaku is usually in the fridge, or sometimes sold at room temperature on the shelves. 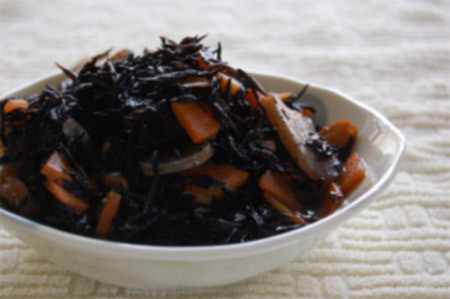 Soak dried hijiki in cold water for at least 30 minutes. Drain. Cut chicken into small pieces. Slice carrot, konnyaku and abura-age. Place all the ingredients in a pot. Turn on the fire and bring to gentle boil. Turn down the heat and simmer with lid on for about 10 minutes.